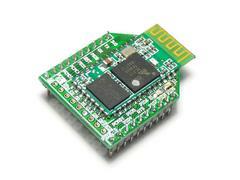 As another example of Android-controlled Arduino boards, this one is a success. You can also control other Arduino systems, as the Android app is basically controlling Arduino digital output pins. For more information, app links and more visit the MOBOT project page. And for more news, updates and items of interest.please follow us on twitter, Facebook and Google+. During a busy day in front of the PC you can often have twenty or more tabs open in your web browser at once (well I do...) and this can often lead to losing track of the Google Mail pages and therefore incoming mail notifications. 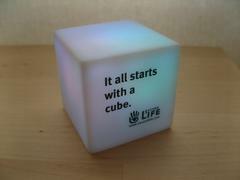 Arduino enthusiast Jamie Matthews has created a way to solve this problem by using an illuminating cube and an Arduino. A Python script runs on the host PC, and when the GMail status is "new mail", a character is sent to the Arduino via USB, which then acts on the character by illuminating the cube. Quite a nifty solution to a common problem that we all face now and again. Furthermore as the project is Arduino-based, you can use almost anything as a notification device as long as it can be switched by a digital output. Clapping Monkeys spring to mind, and no doubt your imagination can come up with something. For the project details, Python code and inspiration, visit Jamie's blog here. And for more news, updates and items of interest.please follow us on twitter, Facebook and Google+. To get started with your own Arduino-based projects, we have a full range of Arduino and compatible boards from Freetronics, DFRobot and more. When working with more complex Ardiuno projects you may find that there isn't enough SRAM - the memory used for storing and manipulating variables when a sketch is running. 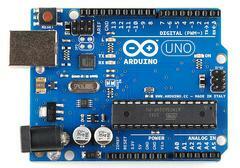 A typical Arduino board such as the Uno only has two kilobytes, which can run out quickly. Of course there is the internal EEPROM, however this is slower and has a finite life. Australian Nick Gammon has described a way to use additional, external SRAM ICs via the SPI bus with an Arduino to increase the temporary memory that is simple and inexpensive. Not only does the Mega2560 have 54 digital and 16 analog input pins, it has eight kilobytes of SRAM, as well as 256 kilobytes of flash memory. Therefore by using a Mega2560 - you have more sketch room, more variable space, and a bucketload of I/O.